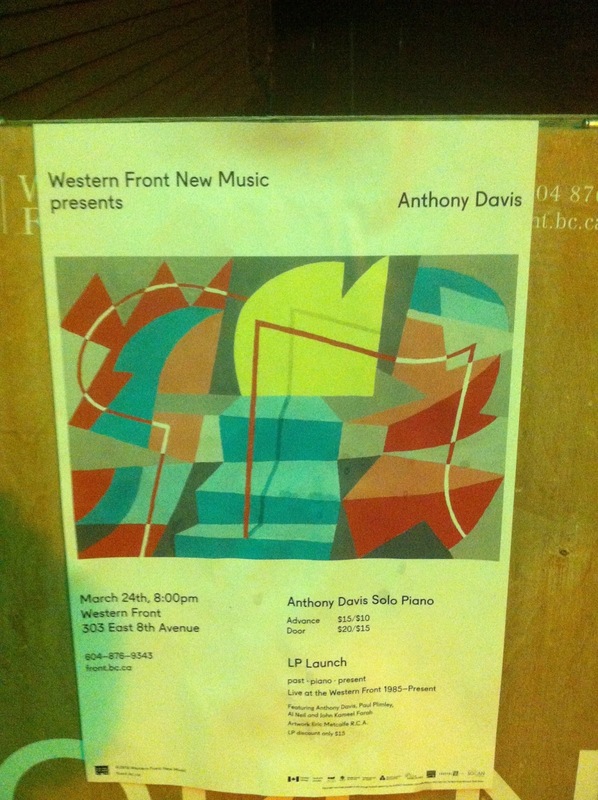 What a privilege to hear Anthony Davis play two sets of solo piano at the Western Front last night. 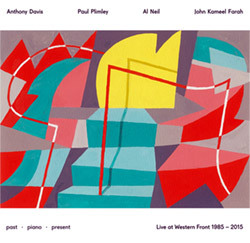 His performance—a return to Vancouver after thirty years—also marked the release of past – piano – present, an LP anthology of audio recordings from the Western Front’s archive featuring tracks by Anthony Davis, Paul Plimley, Al Neil and John Kameel Farah. In her sleeve notes, pianist Dana Reason notes how, in his 1985 performance of “Behind the Rock,” Davis’s “ease mobilizing and maximizing the piano . . . suggests a careful study of Duke Ellington’s rich orchestral tradition.” Not that Davis’s playing sounds studied or academic; his aesthetic – his performance style and his method – seems to offer an idiosyncratic mix of (what George Lewis has called) Eurological and Afrological sensibilities, blurring composition and improvisation, chamber music and blues, Olivier Messiaen and James P. Johnson, recital and gig, to generate a vital, kinetic music of layered possibilities. He played two sets lasting almost an hour each. The first set opened with a piece built from variations on cascading intervals, which Davis later identified as fragments from his composition Wayang No. IV. The second piece, which Davis did not identify, spun magisterially through components of what felt like a 32-bar song, unpacking and reassembling melody with a recognizably Ellingtonian grandeur. The third piece was a version of “Ankle and Wrist” from his 1997 opera Amistad; built on shards of a blues motif, the music surged in swathes gathered and propelled by Davis’s powerful sustain pedal, while his strong left hand offered up lines recalling Sir Roland Hannaor Earl Hines. Davis’s touch is fierce and firm, but he also has a keen capacity for tenderness, as the concluding piece of the first set, a gently deconstructed jazz waltz, suggested. The second set opened with what he called his “Goddess Variations,” improvisations developed around the “orchestral material” from the aria “They come as if from the heavens (Goddess of the Waters),” also from Amistad. He followed with an extended wordless version of “Five Moods from an English Garden,” a work he described composing when he found himself stranded in Munich – after touring with violinist Leroy Jenkins – sleeping on a studio floor; on a snowy May morning, he said, he walked through the city’s English Gardens – listening to birdcalls – and into an exhibit of Wassily Kandinsky paintings – “moods” – at a gallery there. The composition draws onthese two palettes to create a vivid tone poem. The closing piece from the second set involved a return to Wayang No. IV, extending Davis’s exploration of the material in intense overlaid chords to produce what felt like kinetic densities, a powerfully mobile aural weave. 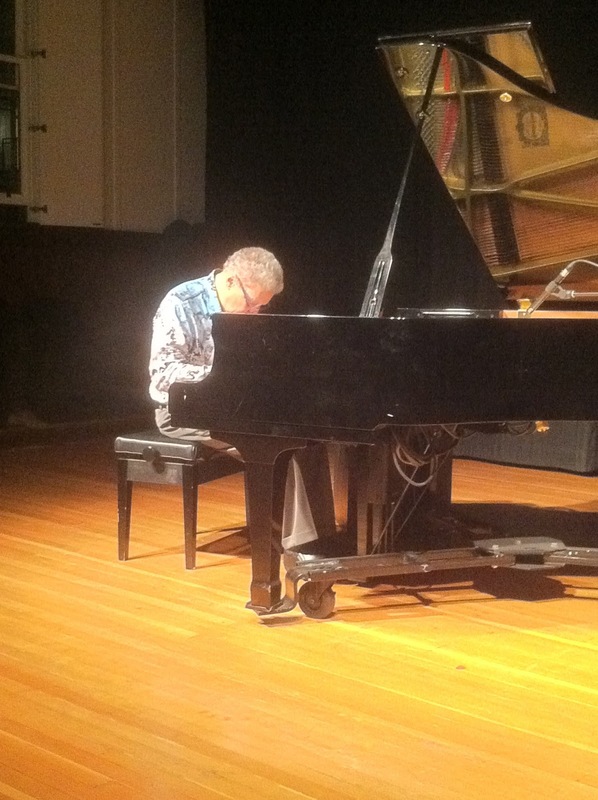 As an encore for an enthusiastic, deeply engaged audience, Davis played a remarkable meditative version of “Monk’s Mood,” a suitably elegant and resonant conclusion to a brilliant concert. 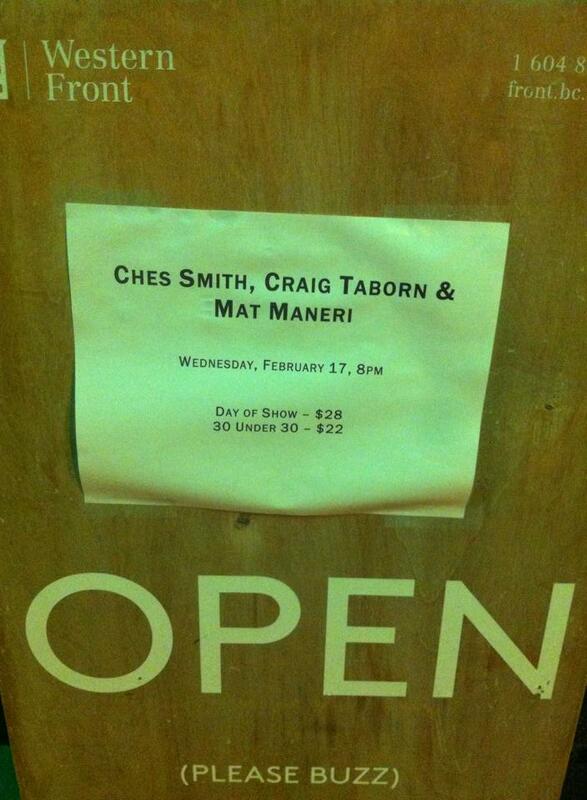 Last night at the Western Front, Ches Smith’s trio (with him on drum kit and vibraphone, Mat Maneri on electrified viola, and Craig Taborn on piano) offered two sets of provocative, engrossing and powerful music drawn from The Bell, their recent album issued by ECM. Each set consisted of extended suites of Smith’s compositions; his writing practice sounds to me typically to involve a logic of serial disjunction, assembling each piece from layered rhythmic and melodic cells—emerging in the recording as fractal loops, insistent frittered ostinato, reminiscent at times of Steve Reich’s music for percussion—conjoined in distinct, contrasting sections. In performance, those assemblages—close to coruscating, unfixed fragments of wordless art songs—link up, often with turn-on-a-dime jump cuts, to produce a compelling admixture of meditative resonance and hard-driving, impactful disturbance. The music feels both openly improvisational and exactingly through-composed, as it moves from the intimate lyricism of chamber-jazz to—I’m not exaggerating—bone-shaking heavy-metal thrash. The first set emerged as a single suite, gradually ramping, like “I Think” and “Wacken Open Air” do on the recording, toward a propulsive, drum-driven wall of sound; the recording itself is quieter, with the drums mixed down a little, while in performance Ches Smith will build a thunderous and gleeful abandon. (I don’t know which compositions were played in which set, although I think they began with “The Bell”; they may have played extended version of the album tracks in order, since the second set—which featured two more compact suites instead of one—closed with “For Days,” the final cut on the recording.) 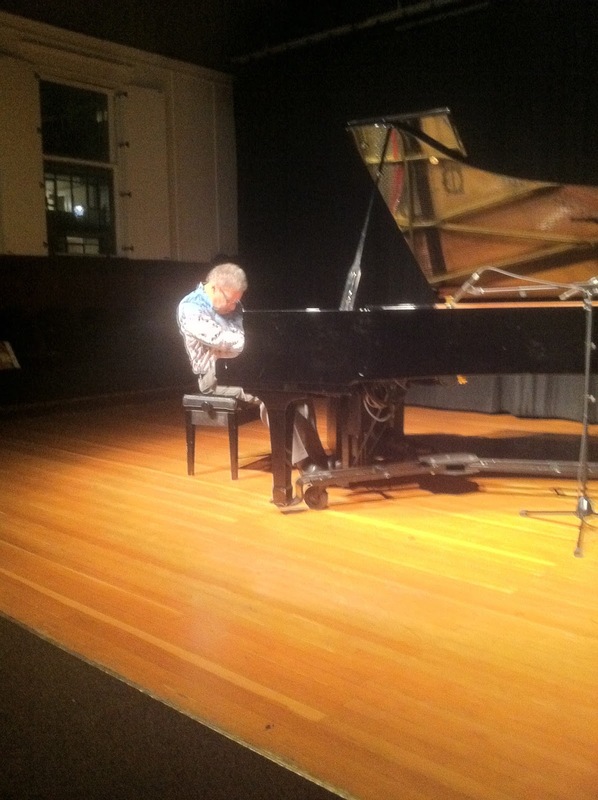 Craig Taborn’s lines concentrated principally on repeated motifs, either locked chords or looped shards of melody, but he also provided an insistence, a fierceness, that introduced a provocative and—if this is the right word—actively contemplative energy into the potential stasis or fixity in such unwavering recurrence to push the sound forward. Gilles Deleuze names a philosophical version of this practice, simply, the imagination: “The role of the imagination, or the mind which contemplates in its multiple and fragmented states, is to draw something new from repetition, to draw difference from it. . . . Between a repetition which never ceases to unravel itself and a repetition which was deployed and conserved for us in the space of repetition, there was difference, . . . the imaginary. Difference inhabits repetition” (Difference and Repetition 76). Mat Maneri’s contributions on viola either established electronically-enhanced bass drones, or, more frequently, negotiated the interstices of upper-register tonality, pulling at the spaces between notes, microtonally fraying and re-stitching phrases. All told, it was a truly powerful gig, the trio collectively laying down a spate of compelling trajectories through variegated tensions and multiplicities: overlapping lines that attend on, that sound, I’d say, the “barely intervallic” collisions and differences inherent in present-tense collaboration, to grant an audience moments of shared, unsettled, and imaginatively rich listening. Gilles Deleuze. Difference and Repetition. 1968.